Vignettes are like telling a story with the things you have in your home. They bring personality and warmth and tell all who see them who you are. 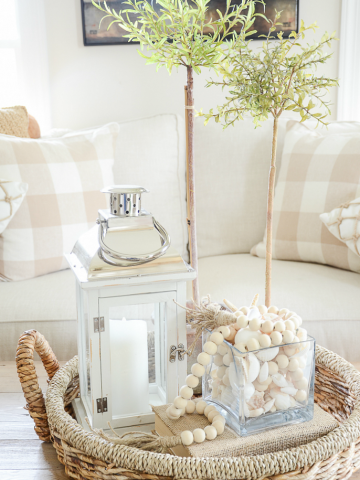 Vignettes are such a personal part of decorating a home and should be incorporated in every single room! 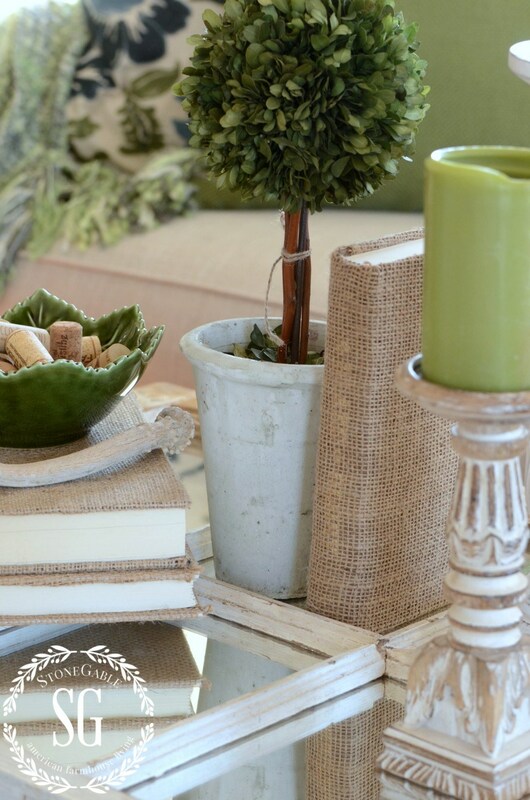 I think of all the home decor things I do, creating vignettes are my favorite! They are a shop-the-house grouping and can make a space go from nice to amazing! 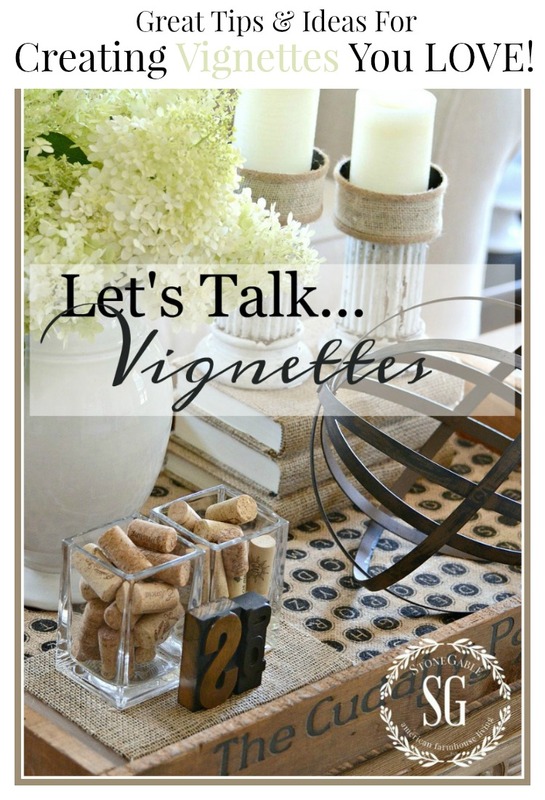 Today it’s Practically Speaking and we are talking VIGNETTES! Today is the day of the week we get practical about decor and organization and our home/self connection! I love Practically Speaking days. I hope you will participate in the discussion. Please feel free to comment on other’s comments, but please keep it nice! I think vignettes come so easily to me because there are just a few “rules” that help to make them fabulous. Other than that we are only limited by our creativity! edit, edit, edit… Less can be more! your vignette does not have to “match” your rooms color scheme… You can be daring if you want! don’t buy new… shop your home! I find myself using the same elements in my vignettes in different ways. I guess I’ve found some things that work with my room and “feel” like me so they tend to show up again and again. Don’t limit yourself to creating a vignette in your living room or family room. 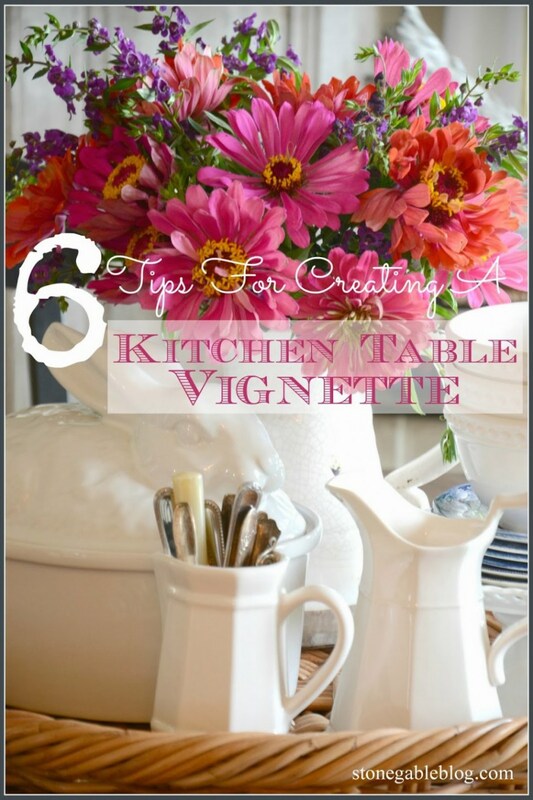 One of the easiest vignettes to create is in the kitchen. So dig our your dishes and other things from your kitchen cabinets and play! That being said, don’t limit yourself to what’s in your kitchen either. Use what works for you! I’m a big fan of seasonal decor. I think it has something to do with the fact that I was a first grade teacher! At school we marked the marching of time by seasons and holidays! I still do that. The kitchen is the perfect place to show off each season’s bounty! Be creative! A vertical vignette works great in small spaces! Pick a room that could use a bit of your personality and create a vignette! Create a curated look that is unique to you and shows off who you are! Your room will thank you for it! 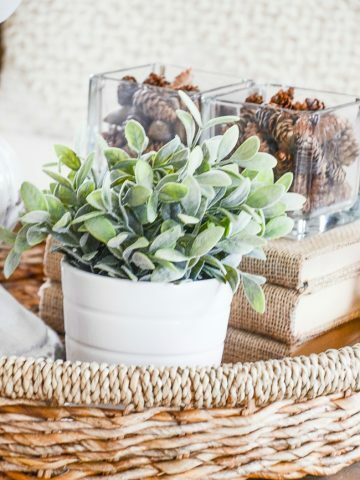 Here are some fun items to put in a vignette! Oh boy! One vignette per room. I really have only one room. With an open floor plan all my vignettes are visible at once. It is very hard not to have a cluttered feeling with this room set up. Picking just one area would leave too many bare spots. Do you have any suggestions? 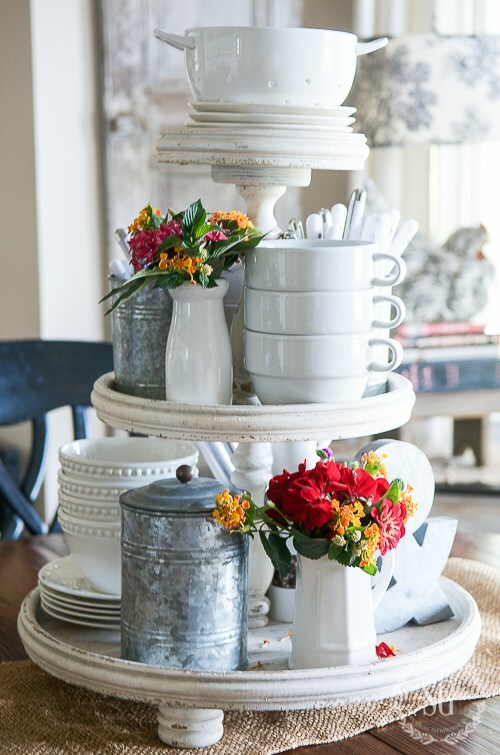 Love the white 3 tiered tray where can I buy that piece ? Love your ideas! I wish I had your skillset at decorating! Thanks for the inspiration! Blessings to you! Your ideas about grouping objects together for a memorable vignette and your pictures are just beautiful! As always, Yvonne, this was a lovely and informative post! I’ve been playing around with decor ever since I was 12 years old … one day, taking all my Mum’s oranges out of the fridge and putting them in a basket in my bedroom! Why? Because the orange color really “popped” with my bedroom colors. Unfortunately, after I was asleep that night, she took the oranges all back and returned them to the fridge. lol! I love using antlers. The wood box with Cudahy on it put a smile on my face as my Dad was a salesman for them and retired from there. I am going to keep my eye for one. Hi Yvonne, I have been follow your blog for just over a month and just love, love it! I finally put together my first vignette ever and it looks FAB thanks to your guidance. I am DIYing Christmas décor now to work with the décor that I already have. I love your style. Thank you for the inspiration. Lovely. I love the neutral color palette. Great article and this is what I always struggle with! You have given me some new ideas so I will try them out soon. I need to do something creative right now. Thanks for the great ideas Yvonne. I love the pictures. As always Yvonne, you are so creative! Thanks for sharing your inspiring ideas with us. Yvonne, I love your vignette rules!! Very helpful! Hoping to hear from you soon as winner of September’s contest! Please let me know when I can expect to receive the 100 dollar gift card ?? Love vignettes. Unfortunately, I do have more than one in my kitchen, but I never thought about it looking busy. I will have to go back and reevaluate! 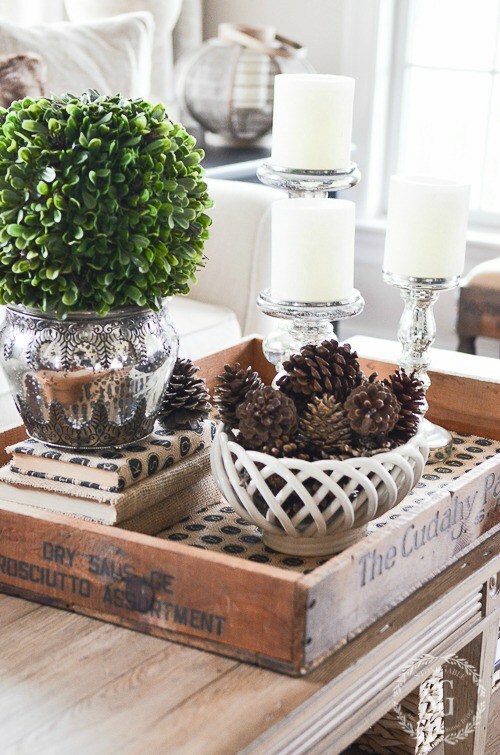 I love doing vignettes using trays and old wooden boxes. seasonable items.Especially liked your use of the 3 tiered tray,so fun. Incorpating wine corks in a vinyette is a terrific idea. I like them in the clear glass vases as shown in your post. A fun idea I saw in a magazine is decorating a small Christmas tree with beautiful wine lables, corks, faux grape clusters, and tiny faux wine bottles. Looked so nice and festive sitting on the beverage table along with a selection of wines and wine glasses. Covering books with purlap…I love that idea. I do have a question for you. One vignette per room? piece. I sure love it!! Love the vignettes, I think it does show what our life is like in our homes and who we are, our personality. You are such an inspiration. I love all your vignettes and I’m off to create my own. Shopping my house is the perfect solution. Keep the ideas coming! How wonderful!! Great ideas. I’ll be creating my own vignette ASAP!! Love doing vignettes. Some of my fun finds come from Goodwill. Thanks to you, I am learning to incorporate some vignettes into my decorating. I like grouping things on trays, and am always on the lookout for unique ones when I shop. I am glad to learn only one vignette per room. Totally amazing how just a vignette and pillow change simply changes your room!!! I have a huge floral basket from my mom’s memorial I have to dismantle so I’ll do a new vignette. I did get some mums so I have a vision. But first things first. I’m to make some more “arrow” favors out of honey straws –a neat new packaging idea a beekeeper friend thought up and they make the perfect shaft with paper arrowheads and feathers. Best get busy. THEN I’ll fiddle with a vignette!! Being a woman with a small income, I loved the idea of “shop in your house”. I was able to pull a few small pieces of my grandmother’s siverware, use some depression Era glass and some fresh cuttings from my yard. Thank you for sharing information. Even a humble home can look “dressed”. Thank you for sharing. I look forward to learning more!! So enjoy your blog. I am a daily observer. I think you could sell that box over and over to viewers. I have a vignette question for you since you so enjoy putting them together. I am a Great Nan to two precious little girls (2 different grandchildren families) who visit often. Yes, this is a special day of family gathering when they visit! I keep my child table and chairs in the living room used as a coffee table. I keep it decorated and it is used other times by adults. I have many toys from my son and grandchildren that they play with when here. What children’s vignette could I use when they come that is their size. Would remove when they were ready to play. I cannot find any child dishes that are large enough or special enough. Have had it set many times for teddy bear picnics and dolly teas. Suggestions would be appreciated!!!!!!!! Thank you. As always, I love your vignettes and tablescapes. They’ve given me such inspiration for creating my own, and I always enjoy seeing how you’ve arranged yours. I have the house decorated for fall, and we ‘re having guests for dinner tomorrow evening. 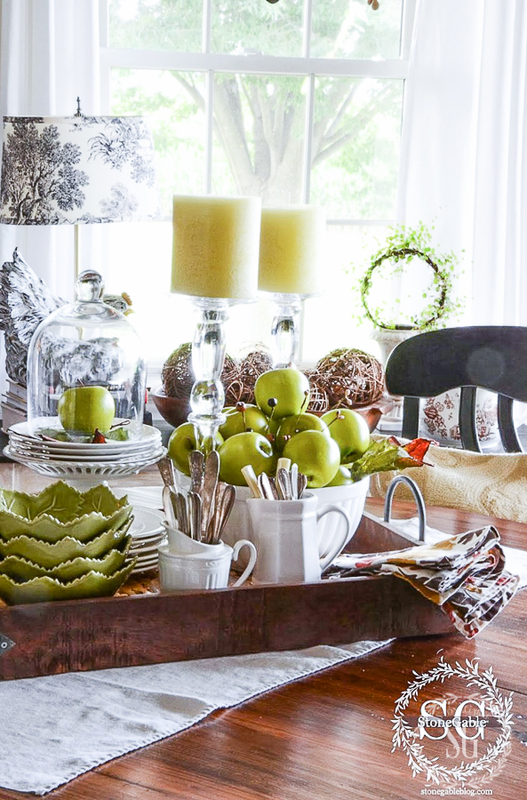 I love setting a festive seasonal table, and welcoming friends into my home–a lot like you. I hope you have a great weekend. Yikes, one vignette per room? I need to start editing and clearing stuff out! Thanks for all your tips and inspiration. It to my own. Thanks for the how to use cake plates also on previous post ,because I now have a couple and use them all the time thanks. Dear Yvonne, I love that you encourage your readers to ‘shop our house’ and copy what we like instead of thinking we need to recreate the wheel. Sweet you…lucky me! Your tablescapes and vignettes are also my favorites. I love different tablescapes. In fact, I plan to change up my dining room centerpiece this Christmas. I need to start designing vignettes. I tend to use only one item, i.e. lanterns with seasonal decor inside. You are creative and overflowing with decor ideas. What beautiful ideas. I have so many of these items in my collection. Vignette is one of my favorite words! Your beautiful blue and white vignette (4th picture down) took my breath away! “It’s okay to copy a style you love” comment! ? I am certain many readers do “copy” you, or, at the very least, incorporate your ideas into what works with what they have. I know I am inspired regularly, and as a vignette lover ( to my family’s dismay) and I often see something you have done and think to myself ” I have that”, or “I can do something very similar” ! Question?? You seems to own quite a lot of items, especially dishes and serving pieces. Where do you store them?? I find myself putting things away and then ” forgetting” about them many times, or they are not enjoyed because they are not somewhere I can see/access them easily. Well done Yvonne! I just adore all of your vinettes and of course your tablescapes. I like the fact that you keep your designs simple. Just yesterday, my granddaughter and I when to the park and gathered various pine cones and acorns and came home and created a fall vinette for my kitchen table. She was so proud of it and she said it looked like something that Yvonne would do. Have a good weekend! As you know I love your blog Yvonne! It always inspires me to decorate, create and style my home just how I would love it! Thanks for the great inspiration! 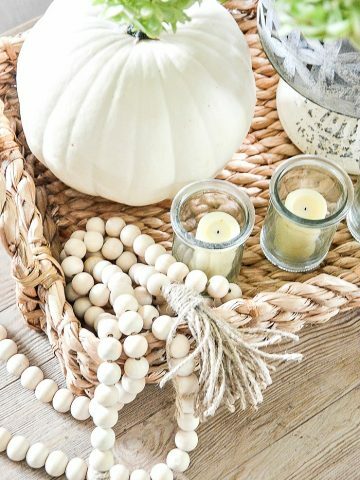 Going to shop my house to make a Fall vignette ? Yvonne, I have improved my vignettes from learning some tricks from you. A few things I needed to improve and it really has made me a better decorated which is my PASSION. Thanks for the inspiration. This was a great blog post, thank you. 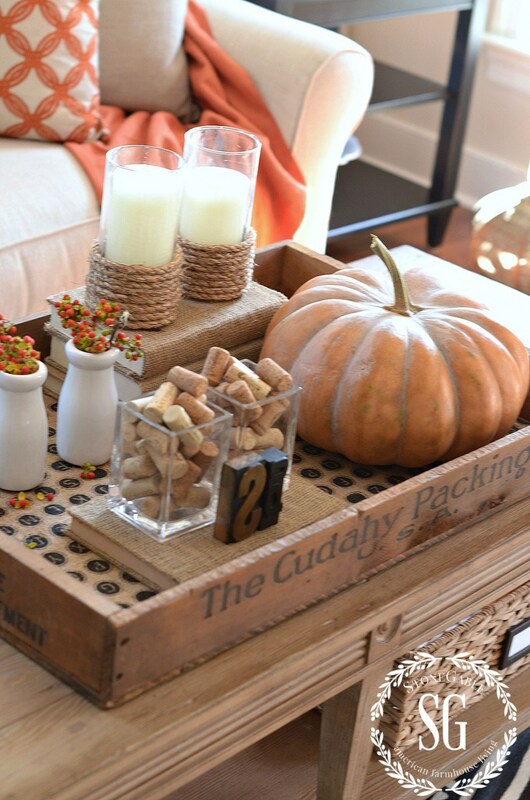 I gathered a tray and some of my own home decor and made a vignette shopping my home. And I love it. I would like to make that wonderful three tier stand, do you have directions for that?? Thank you for sharing your creativity! Hi Jonelle, I did not make the 3 tiered tray. I bought it at a local shop. 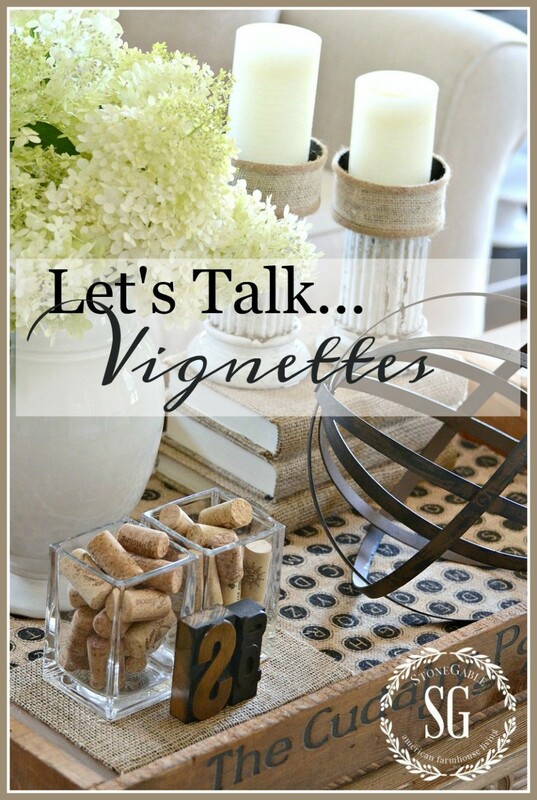 I love vignettes – seriously! I use them throughout my house and on my front porch! I now have a newly redecorated family room and am at a loss as to how to “set the tone”. New hardwood floors, curtains and a new couch and chair. Now what? I have never emptied out a room before and started from scratch. I don’t want cutsy, I want charming!!! I would love to win the consult from you . . . a blank page is a hard place to start!!! Hi Cindy: you have the perfect blank canvas! Put “you” into the room, is my best advice. Don’t copy and create a vignette using items that everyone else does (even though that is a quick and tempting solution!) but put items out that you love and that show your interests. Do you have a favorite vase inherited from a grandmother or an old locket your mother gave you. Do you have a rock that maybe you picked up when on a special trip years ago and you just can’t part with it – even though it is just a rock? Do you have books on a subject that is a passion of yours or your hubby if you are married. 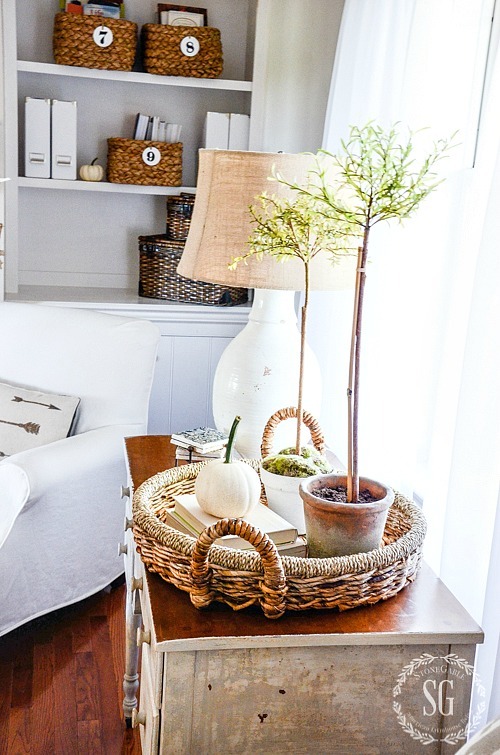 I love decor blogs but just wince when I see almost the very same vignette in every home! They can be SO much more interesting when they represent the homeowner. Dig deep into your own personality and have fun with the process! You really do have a talent for creating beautiful vignettes! I love all your ideas and the gorgeous pieces you use. 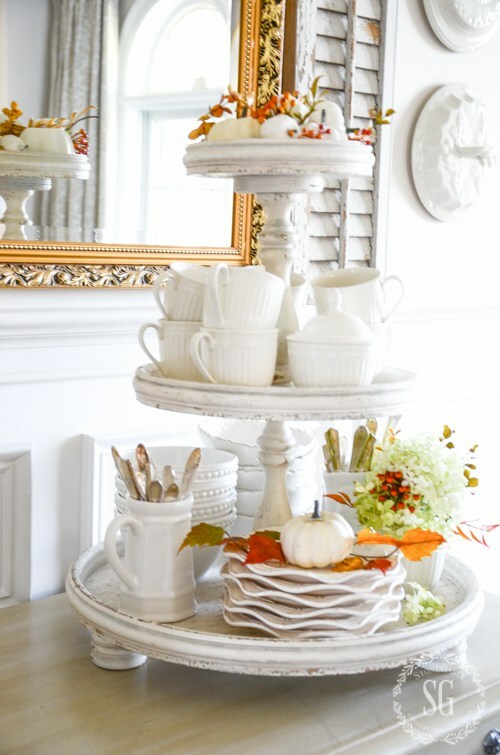 The tiered tray is perfect! Vignettes have become a part of my home also. I try and change them up, so your ideas are so helpful. It is also great to shop your house along with the natural elements. Acorns are falling on my deck as I write this! Thanks for the inspiration. I have a tendency to over decorate. 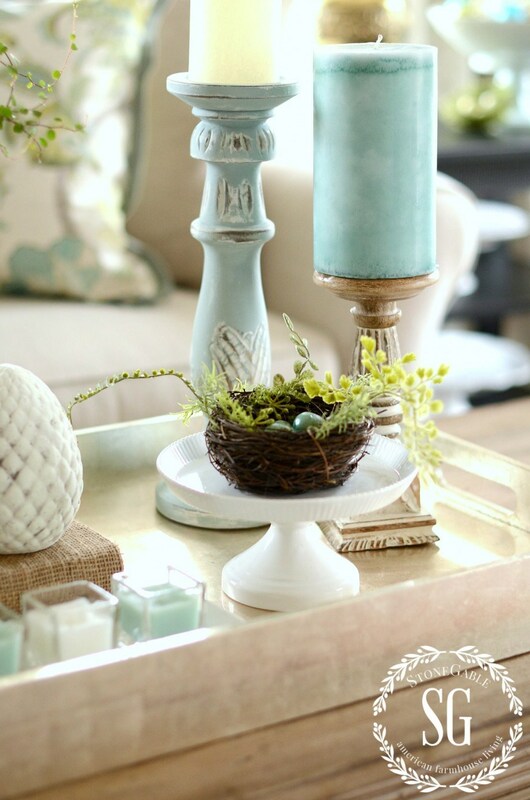 This post gave me ideas of how to create vignettes that are simple and elegant. Vignettes, tablescapes and mantels are my favorites. Yours are so beautiful and do not require unnecessary expense. You have taught me well, especially your suggestion to shop your own home. I have always been fond of natural elements. This grandma cannot take a walk or play outside without filling her pockets with pinecones. Who would think a creamy bowl filled with bleached pinecones could be so pretty? Always a joy to “visit” your lovely home. Have a blessed day. Hi Jane, you brought back such a lovely memory of my Nani. We used to walk up “South Hill” and she would collect things like acorns and pine cones too! Love your ideas. I refer to your blog constantly for ideas and guidance when do everything in my home. You genuinely have a talent!!!! Lucky me!!! Love your ideas. I refer to your blog constantly for ideas and guidance when doing everything in my home. You genuinely have a talent!!!! Lucky me!!! Love your fall whites. This is the first year in many I haven’t decorated around white pumpkins and I miss the tranquility! I too love your vignettes. I have always changed things up for the seasons. I like the suggestion of a kitchen vignette. I would like to find a 3 tiered stand, since my space is limited. Thanks for ideas. I love your style and have started a vignette board on Pinterest. As a newcomer I’m just starting to see all of your goodies. I love your ideas and I’m also a firm believer of less is more. Look forward to all of your posts! Welcome to the StoneGable family, Sharon! I always love your vignettes! Those and tablescapes are my favorite. It’s just fun to see your ideas! 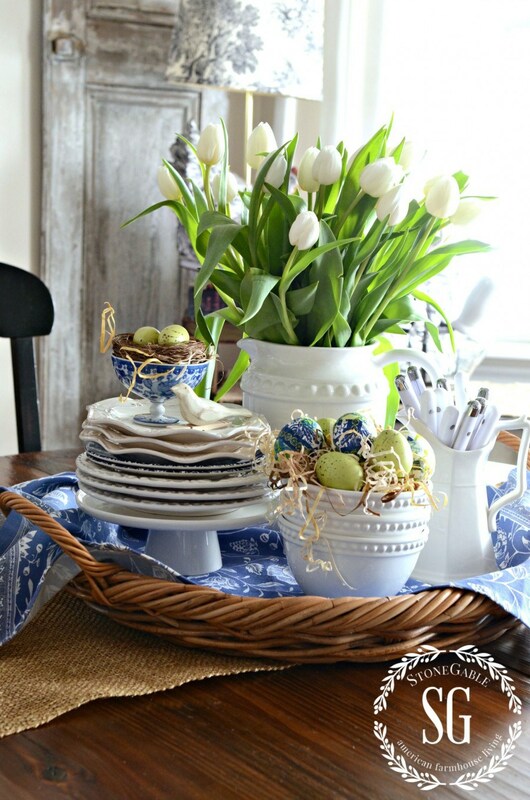 I also LOVE dishes, cups and saucers (mostly white like yours) and love to layer them in my vignettes and tablescapes. Stacking dishes…I learned that from you! I love to change things for the seasons and I always get great ideas from you. Thank you, have a lovely day! HI Karen! I love to see your comments because I think you are one of my most faithful readers! I’m thrilled to hear that you are learning from StoneGable! YOU GO GIRL! I love to see your creativity shine each time to put together a vignette – you have such an eye for detail and so many great ideas!! 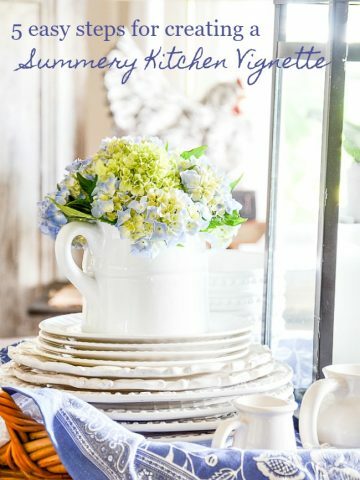 My favorite are your kitchen vignettes, where you use your wonderful collection of dishes to create a “useful” display. I also love creating seasonal vignettes and changing them out with the changing of the seasons. Thanks for sharing! Have a great weekend…. I just discovered your site, I love it, very well displayed and fun to look at. Welcome to the StoneGable family, Susan! 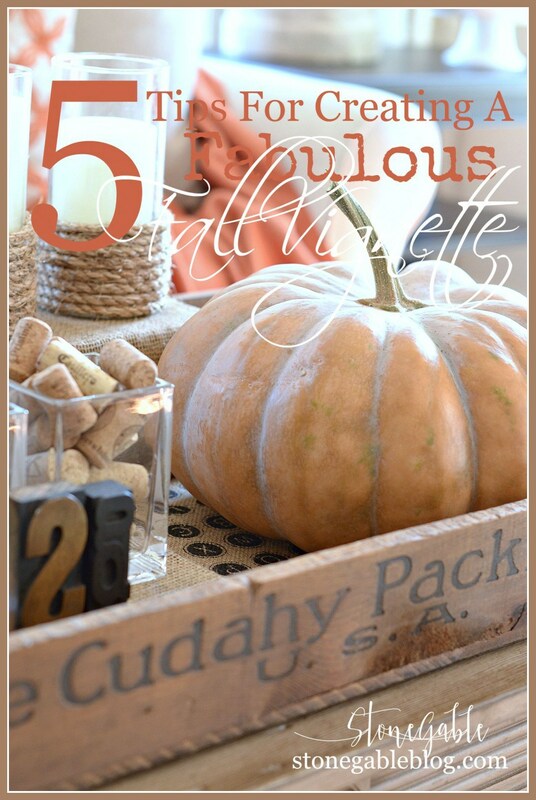 Being a Wisconsin gal myself, I too love your wooden Cudahy tray/box…..did you find it locally near your home? 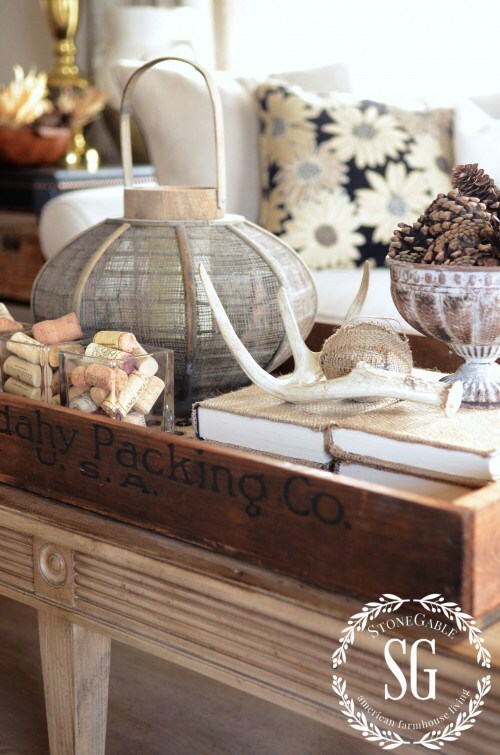 Wooden boxes are great for vignettes. Thx for sharing! Michele I live in Pa. and found this box at a Vintage Fair. It was love at first sight! I added the burlap fabric to the bottom of the crate because it was not in the best shape. It’s my very favorite way to corral my vignettes. Your vignettes are always a treat to see, Yvonne. By jove, I think I am getting the hang of creating vignettes…thank you so much! !You are right…practice, practice and then it does get easier.Every blog you show about vignettes…I dissect and think on how I can do in my decorating. You must have been a Wonderful Teacher!! The children were very lucky to have you and the parents as well. It seems like a life ago that I taught. It was a very special time in my life. I loved it and my kiddos! My personal favorites of the things you show us are your vignettes and tablescapes and especially when you combine the two. I love to watch your creativity shine. I agree, it speaks to who you are and inspires us to want to make our home as warm and welcoming as yours! Thanks, Yvonne, for making this another lovely scroll that I could look at again and again (and I do!) Happy Day to you! Happy Day right back at ya’ Sherry! Yvonne, you are the master of vignettes. From reading your blog all these years, I have enjoyed displaying things I love in vignettes in our living room, kitchen, and family room. My grandchildren are the first to comment on my seasonal vignettes. Your home is enchanting. Isn’t it though? I think, were I to visit her home, that it would be a few days before my eyes could take in all the lovely details!! Thanks so much Sandy! I’m so thrilled your grandchildren comment on your vignettes. YOU GO GIRL! I always enjoy seeing your CUDAHY box. Brings back my young years living in Milwaukee which was right next to the town of Cudahy, Wisconsin and the meat-packing company there. As Bob Hope would say “Thanks for the memories”. Love your ideas, Yvonne. I used to own a consignment shop (retired) and there was nothing more important than the vignettes. Nothing sold things more quickly. Thanks again. A consignment shop is a great place to find some of those fun little stand-out pieces for a vignette!